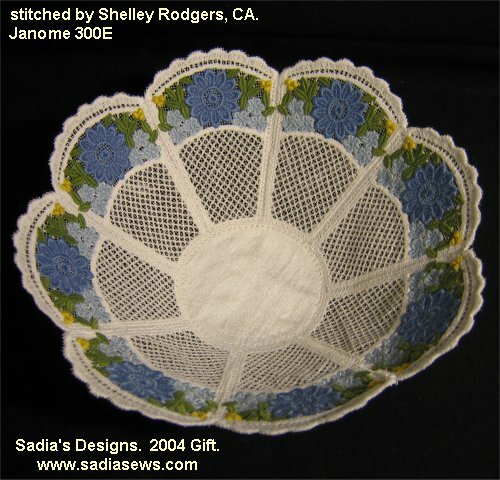 This is a lace panel bowl, a freebie from Sadia Sews. Each wedge-shaped panel took my machine 1 hour to stitch out, but then I was being cautious and stitching at a slower speed. At this time, I had a VERY meager supply of thread to use, virtually none of the standard trilobal polyester or rayon threads that I now know about. Therefore, I used what I had ... matte cotton thread. Even with this very modest thread, the bowl turned out wonderfully. Sadia is such an exquisite digitizer .... her designs are lovely. This design can be found at Sadia Sews.